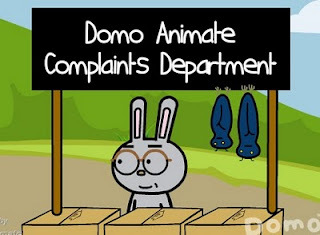 As with the original, The Domo Animate Complaints Department blends real, local web site issues with situations and actions unique to the various characters. Hence Hungry bear addresses the issue of not being able to say any inappropriate words on DomoAnimate (it's a kid friendly site) whilst Domo himself simply provides some comic relief with some relief of his own. Although I do like this particular animation I kind of feel Mr Usaji's personality didn't really come through as much as I'd hoped. It could almost be anyone behind the desk. If I decide to create another in the series I'll hopefully be able to bring in some responses that only Mr Usaji would make.